Can not be used with Cobra Firing Systems and accessories. 2019 Volume Buying Program at Stateline Fireworks offers volume buyers free merchandise and cash discounts on orders over $500.00. The graph below illustrates Bonus free merchandise applied to all in store/off the store shelves piece purchases. Customers are required to register at our store for this program in order to keep track of their purchases throughout the year. The free bonus merchandise can increase, as long as what the customer purchases, meet the certain free bonus merchandise levels. Volume buying program categories are determined by your purchase prior to free merchandise. Gift cards are not cash redeemable but do not expire. 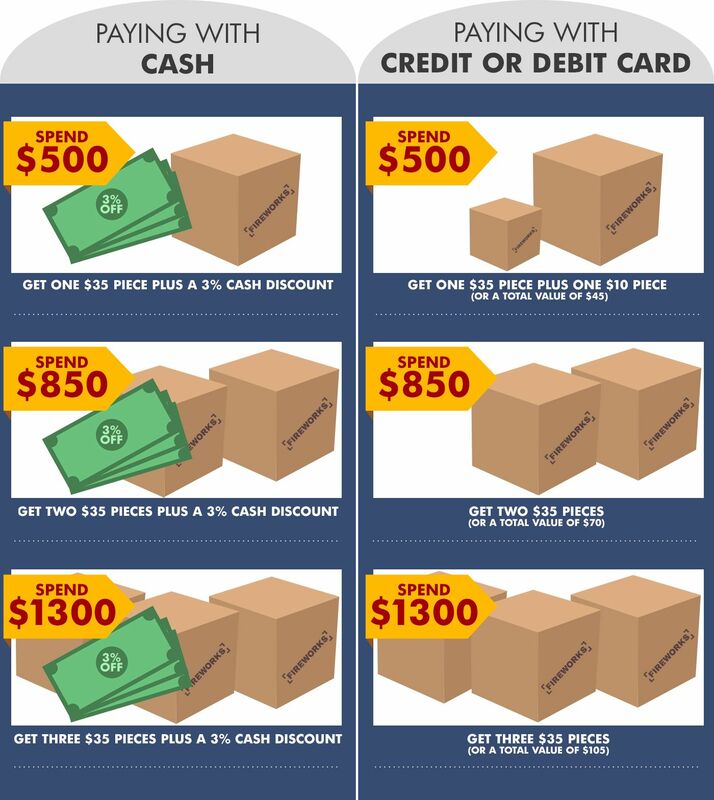 Lost gift cards is the customers responsibility. .
Orders starting at $500.00 and over qualify for free product and CASH ONLY discounts as described in the below graph. . Your account can not be used by anyone else and you must be present in order to use the program. Free product bonus merchandise is based off the total amount spent noted on the graph below . Bonus fireworks can not be used to discount the total of the sale. Program can be used for a group buy, as along as the account holder is present at time of sale. The bonus fireworks level you have achieved for free bonus fireworks and 3% CASH ONLY Discounts, is based upon your percentage is only good for one calendar year starting on January 1 and ending on December 31. Customer must mention the Stateline Volume Buying Program in order to receive the bonuses. *You can not use this program for case sales, Cobra firing Systems and firing accessories or *pre-packaged assortments, but your case sale purchases and *pre-packaged assortments can be applied to increase your volume buying program. *Tray or Boxed pre -packaged assortments and Cobra Firing systems and accessories can not be used with this with program. Cobra Firing systems and accessories are not discounted nor can be used as "Free" product with this with program. Gift cards can only be used only for retail purchases and are not applicable for case sales. Multiple purchases throughout the year can be combined and may increase free bonus merchandise for that calendar year only. Graph does not apply to case sales. Multiple purchases throughout the year can be combined and may increase discount for that calendar year only. Minimum purchase for case sales (After your discount) is $700.00. This chart only applies to FULL CASE SALES and does not apply to individual items purchased from our retail store. Case sales take at lease 72 hours to process due to the items must be shipped from our warehouse to the store for pickup. There are no case sales between June 27th to July 6th. All purchasers (with the exception of active military personnel) must be over 21 years of age.